The brilliant morning brought dozens of fat, buzzy pollinators into the garden. The locals were not easily taken in by Taffy’s “Bee Bum” Hat, however, and went about their vital task without much comment. Oh, how dear and cute that hat is! Please Jane, you must write a book. Your writing is just so delicious, entertaining and clever. Thank you for your posts. I am glad to see Taffy “all dolled up” today…I don’t know what’s wrong with those pollinators, I think her hat is worthy of notice! The days have been blisteringly hot the past week. I suspect everyone wants to get their pollen and knock off work by noon… Thank you! 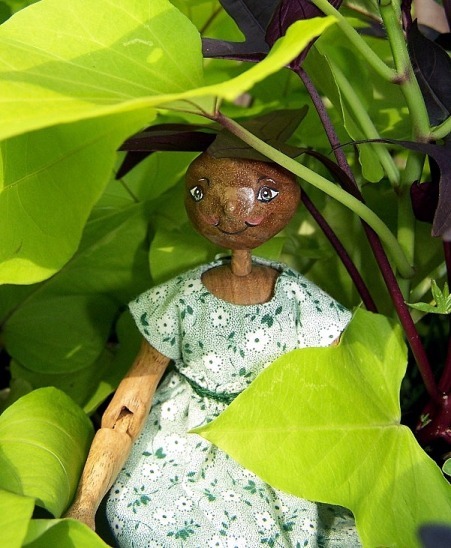 Penny the traveling clothespin doll shares her adventures at home and abroad.